In the Middle Ages, the port of Fowey was home to warships and galleons, but today it’s better known for its excellent cuisine, warm welcome and beautiful views. From Easter onwards the town buzzes with thousands of visitors keen to soak up the atmosphere and recharge their batteries – but how to get the most out of your time here? Walking is a great way to explore Fowey and all its charming nooks and crannies. 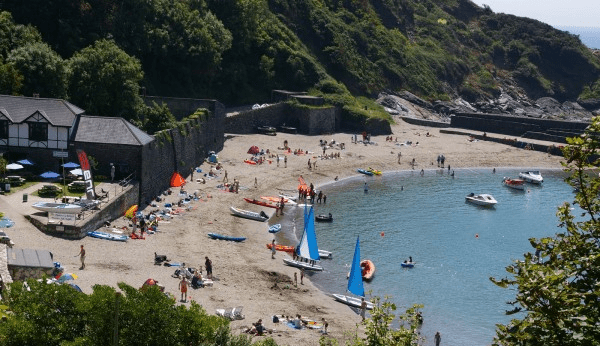 Dramatic Lantic Bay, Polkerris Beach and the fishing village of Polperro are all within a day’s walk. There’s also the famous circular Hall Walk encompassing two ferry rides across the estuary. There’s some great pubs along the way too. The Ferry Inn makes a rewarding pit stop before crossing back over the estuary. Just make sure you don’t miss the last boat back unless you fancy a night under the stars and on the sands, or in the pub (perhaps not such a bad thing). Did you know Fowey was the inspiration for Kenneth Graham’s Wind in the Willows? It was also where Daphne du Maurier wrote many of her novels. Visit the house where she wrote her first book, and evoke childhood memories with a trip to ‘Toad Hall’ or Fowey Hall as we know it. If you’re tempted to shout “Poop Poop” out of your window as you drive out of town, no-one will mind…we’ve all done it! Feel the cool water on your fingertips as you give kayaking or sailing a go. Encounter Cornwall takes you on stunning river adventures in a kayak, stopping for lunch in some picturesque villages. Or, you could try catching your own dinner with Dan’s fishing tours and river cruises. Whatever you catch is yours to keep and cook – and don’t worry, you won’t go hungry. Dan will make sure everyone gets something to take home, even if it’s just a mussel or two. Fowey boasts a thriving high street of niche gift shops, art galleries and well known brands such as Seasalt and Joules making it the perfect place to pick up a unique birthday gift or holiday souvenir. Make a day of it and break for a traditional pub lunch or glass of champagne on the waterfront terrace at The Old Quay House. If you end up overdoing it on the clotted cream, you’ll be forgiven for wanting to ‘walk it off’ with a browse around the shops you missed first time round. The Eden Project and The Lost Gardens of Heligan are fantastic local attractions within 20 minutes drive of Fowey. Get steamy in the rainforest biome, discover new plant species, or view fascinating birds in the wildlife hide. Get closer to nature and to Cornwall. Just watch out for The Sensitive Plant. It’s known as the plant that moves and can cause quite a stir when it’s touched. Adults you’ve been warned. And if warships and galleons are more your thing, then make sure you visit the Fowey Museum. Tucked away inside the town hall, you may think you’ve stepped back in time. Fowey Mussel Festival 2012 Who cares whether it’s local?